A music video of “Shark Family” ranked as the most popular video on YouTube for 2017 in Korea, Google’s video platform revealed Thursday. The “2017 YouTube Rewind” was made based on views, likes, comments, shares and more. Here is a list of the top 10 most popular videos. 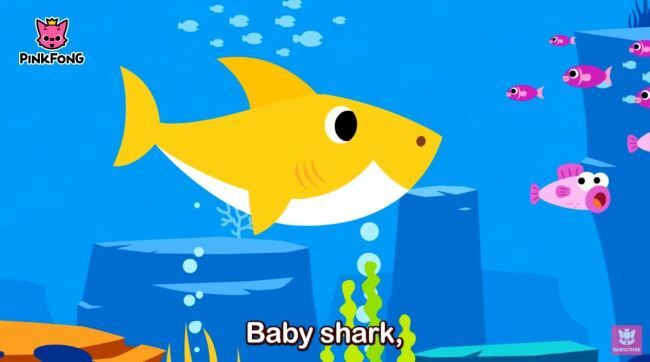 The 1 minute 56 seconds animation, which depicts shark family members living under the sea, reportedly garnered more than a billion views. The children’s music creator “Pink Fong” made the video. Korean musician “J.Fla” singing “Shape of You” by Ed Sheeran. “Cypher” rapping video of the “Show Me the Money 6” came third. The producers of the rap audition, including Jay Park, Dok2, Tiger JK, Bizzy, Dynamic Duo, Dean and Zico, starred in the video. Dancers from “Viva Dance Studio” covering Psy’s latest song “I Luv it” ranked 4th. “Cardio Hip-hop Dance,” dubbed as the dance moves which help a person to lose 10 kilograms in two weeks, ranked 5th. “President of the children,” Pororo claimed the sixth spot of the most popular video list. That girl who interrupted dad’s live interview on the BBC News. The video of Professor Robert Kelly being interviewed via Skype ranked 8th. “Liquid Monsters” took over YouTube this year. A video of YouTuber “Wookkang” making slimy grape whipped cream monster was viewed over 6 million times. The cast of Kingsman trying Korea’s signature crispy fried chicken for the first time and their reactions swept the internet.